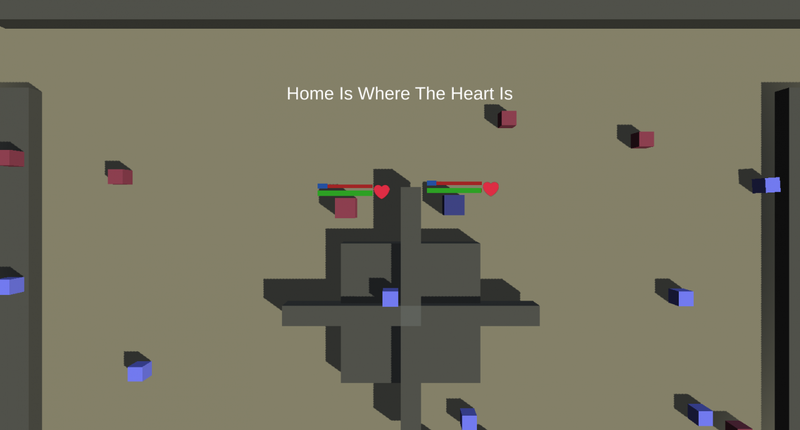 "Home Is Where The Heart Is" is a couch co-op game about supporting each other overcome obstacles. Overview: Stay alive as long as possible by maintaining your health(red bar) and energy(blue bar). You can "boost" other players onto ledges by moving on top of them. Health: Health can only be replaced by the other player tapping their "Give Health" button. The faster you tap your button the faster you will be able to give health. You will slowly lose health over time which is multiplied by the amount of distance between the players. The further you are apart from the other player the faster you will lose health. Energy: Can be replenished by adsorbing the cubes of the same color. You can "boost" other players onto ledges by moving on top of them to access Energy that would otherwise be accessible.